Believe me when I say I am not complaining but with summer having hung on well into September it’s difficult to digest that Christmas is just 12 weeks away, and before that, there’s Halloween to craft for first! Well, we hope to keep you on track with loads of inspiration for all your crafting this season including spooky paper lanterns, creepy party invites and spellbinding fancy dress accessories the kids will love to wear with their fairy or wizard outfits, all in our special Halloween feature starting on page 89. Isabel bewitched us and became a true fairy princess as she posed for the camera waving her sparkly wand! 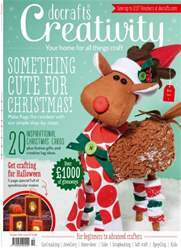 Rags the reindeer, our cover model, was the inspiration of brilliant designer Sharon Dobson, and sets the scene for the wealth of festive makes we have to share. Uncover the wonders of rag-rugging and bring Rags to life with simple step-by-steps. If you are ahead of the game and have presents waiting to be wrapped, then please don’t start until you have read pages 45-49. From Nordic to nostalgic, find a tag that suits your gift wrapping style, or make an edible poinsettia to adorn your Christmas cake, devised by our talented newest designer, Alix Fauvel on page 32. Don’t forget to redeem your money-off vouchers - download them this month from docrafts.com and help stretch the pennies a bit further when gift buying, or for that well earned pre-Christmas treat!